We are stoked on the Snowcaps! My hematocrit* was 41.8 when I started, and now it is 45.9 -- an increase of 10%. I'm strong as hell....I feel like I am an airplane when riding my bicycle..!!! *The higher your hematocrit, the more oxygen can be delivered per volume of blood. Thank you! Our team uses these machines to great effect, an excellent product. I would like to let the running world know how I felt yesterday on my long training run 18 miles. My training friends' average age is 23-35 and I'm their motivation to stay on pace. We averaged 7:00 -7:20 per miles during the run. I know that sleeping at altitude gives me an edge... I definitely see a huge improvement, especially in the second half of a race. 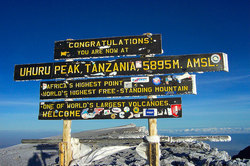 Wanted to let you know that of our team of 8, I had zero altitude issues—no headache, shortness of breath, or other AMS--even at the summit of Kilimanjaro hiking to Uhuru Peak. Most of the rest of the team either had to go on Diamox or suffered headaches/altitude shortness of breath and had to head down fairly quickly. It was almost certainly a result of the Higher Peak altitude tent training. My hematocrit normally ranges from 35-39, but since I starting altitude training, it has increased to 46, up about 20%. My power numbers improved by 14 to 16%. At our level, increasing even 2 to 3% would be considered exceptional. I can drill out high-intensity interval training one after another, I'm glad for the hypoxic training that I am doing. It really does make a difference and why so many top athletes in all sports are doing it. You would be amazed at who and how many. With the Mountain Air Generator, I have never been so fast in my life. My marathon time went from 3:16 to 2:55. My 5k time went from 17:35 to 16:45. Here I am at age 36 and I am crushing all my PR's from my 20's! My MAG is working perfectly, according to the analyzer....GREAT PRODUCT!! I'm glad I invested money in the MAG...such a great price! What a great, great product. I am extremely satisfied! I used the 3 grand I saved on another racing bike. You guys are awesome. 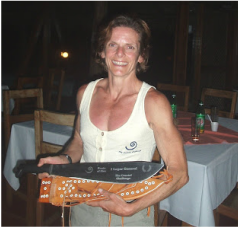 I am a 2006 Winter Olympian in biathlon and am a five-time National Champion. I am just lucky to see huge jumps in performance and blood values with altitude training. We have our World Championships in Northern Italy next season which sits at a fairly high altitude, I want to be fully prepared for these. Professional Triathlete Felipe Bastos has 35 overall career wins. The Brazilian native has been a Higher Peak user since 2007. "None of them [my nutrition and equipment sponsors], however, help my performance as much as Higher Peak." Super recovery and able to sustain a much higher heart rate day to day. I got a fantastic product for a great price. The power is noticeable…about 10% for efforts between 5 and 30 minutes so far that I’ve been able to measure. David Roskelley and Steve Pearson, members of the LDS Church, recently returned from a memorable expedition to the summit of Mount Everest, the tallest mountain in the world. 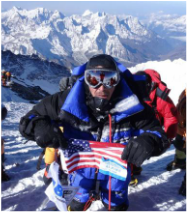 In addition to running marathons, Pearson, who then lived at sea level in Boston, rented a hypoxic generator and slept for two months in a little tent on top of his bed at a lowered oxygen level that would simulate 14,000 feet elevation, he said. Sitting atop the world at 29,029 feet elevation, two friends attempted to sing the LDS hymn "High on the Mountain Top" as it may have never been sung before. Just as a note of possible interest to you, I have run two 50k races since starting to use the system and have won both. The first, in Tahoe, I beat my previous course record by about 4 minutes, the second in a Northern California Park called Whiskeytown, I was about 7 minutes slower than the course record I set last year but it was only a week after the Tahoe race so I was not fully recovered. Many thanks Mark, and I'm loving the generator and tent! My hematocrit is now 49 up from 42 the last time it was tested. I have been sleeping at 14,000 ft. with the mask. I consider this great.. I have been using the MAG for just 3 1/2 weeks and my hematocrit and hemoglobin have both increased over 6%. I am still 4 weeks away from my peak competition and the MAG is helping me reach my goals. A custom high-altitude stall powered by six Mountain Air Generators helped Broad Bahn cut two seconds off his previous best time and win trotting's biggest prize. I wanted to follow up after the purchase of the IHT system from you a couple of months back. After using the system, I have won the last 4 events I have entered and actually set a course record in an event last weekend by 23 min. The best part is that both myself and my fiancée, who is also using the system, have qualified and will be representing Canada at the World Cycling Championships next month in South Africa. Fantastic results and I couldn't have done it without the Higher Peak system. Thank you a lot for the quality of the service and for your time. You took time to answer all of my questions about the hardware and I really appreciated. I can sleep with the mask without any problem. It's really nice. Hope I can giving you good news for the Canadian and World championship. I previously had a Hypoxico system. Got your generator and it is equal quality to your competitors but it has a wider altitude range. And cheaper too. I couldn't be happier. Just wanted to give a update on my progress with the MAG. Feel great 8 weeks at around 13,000 feet. Just finished a half marathon and took 6 min off my time. It is a great product - going to try sleeping in it for the rest of the year just because I feel so much better after sleeping in the chamber. Just thought I would say thanks for the great product and price. Keep up the good work! ﻿Generator is still running strong after 4 years. 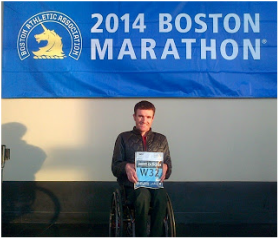 April 2014: Santiago Sanz improved the Boston Marathon course record in class T52 by more than six minutes. With this victory, Santi has 85 victories and 40 course records. This year he won and set new records at LA, London and Boston Marathons. Santi has been a Higher Peak user since 2008. I wanted to let you know that since I began using the Higher Peak Mountain Air Generator I recently ran a PR of 4:03 in a road mile, and won the Richard Calaiguiri City of Pittsburgh 5K with over 2200 runners. Both at the age of 43. On average I have been 10 seconds per mile faster since I started using the MAG. I am very impressed with the Higher Peak High Altitude Hypoxic Air Generator. I think it is an improvement over the "tent systems" on the market. I have been very pleased with the comfort.